We send you an inspiring, beautifully designed quote every day to your email address. If you want, we’ll send you the quote on a poster, t-shirt, or computer skin, and more. 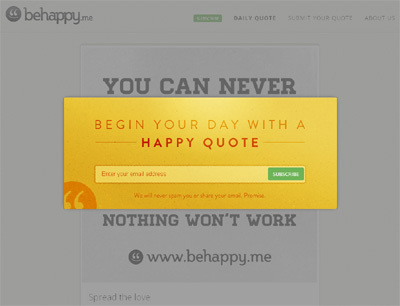 Behappy is revolutionizing the daily quote experience. Instead of “just a quote”, we’re adding the beauty and simplicity of design, making the moment you open the email an impactful experience on many levels of consciousness.